Which 2019 Honda CR-V Is Right for You? 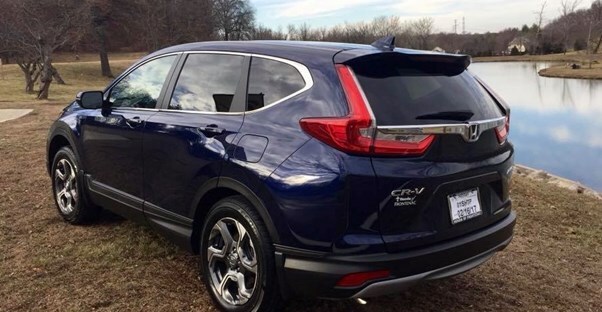 The Honda CR-V is not just one of the most popular SUVs out there, it's also one of the most popular vehicles in America. But deciding to buy one isn't quite enough—you still have to pick which trim you want. Each of the CR-V's trims adds additional features, but at what point do you cross the line from necessary accessories to luxury comforts? This detailed breakdown will help you determine which 2019 Honda CR-V should be in your garage. The 2019 Honda CR-V LX with front wheel drive is the least expensive 2019 Honda CR-V on the market with a starting MSRP of $24,350. Despite being the cheapest, it still comes with some pretty great features. You get daytime running lights, a multi-angle rearview camera, fold-flat 60/40 split rear seats, and 18-inch alloy wheels. The CR-V LX is equipped with a 2.4L four-cylinder engine, hill start assist, and active noise cancellation. Because it has a smaller engine, it gets great gas mileage for an SUV. The EPA rates its fuel economy at 26 mpg in the city and 32 mpg on the highway. Upgrading to all-wheel-drive decreases the fuel economy slightly to 25 mpg in the city and 31 mpg on the highway. Conversely, it increases the price to $25,750. As is typical on Honda vehicles, there is an array of active and passive safety features. This makes the CR-V LX perfect for new and inexperienced drivers. Along with the multi-angle rearview camera, it also has a tire pressure monitoring system, brake assist, and electronic brake distribution. A seatbelt reminder ensures drivers and front-passengers alike don't forget their safety strap. Finally, there are also side-curtain airbags with rollover sensor. On the inside, the CR-V LX’s entertainment system includes Bluetooth connectivity, Pandora compatibility, a radio data system, and speed-sensitive volume control. There are four total speakers throughout the cabin, as well as a USB port. All the infotainment apps are accessible through a five-inch color LCD screen. The 2019 Honda CR-V EX is the next step up and starts at $27,250. It comes with everything the CR-V LX has and more. Some of the most notable features include Honda Sensing and Smart Entry with walk-away auto-locking. The most significant change is that the CR-V EX has a turbocharged 1.5-liter engine. It improves fuel economy to 28 mpg in the city and 34 mpg on the highway while using two-wheel-drive. The all-wheel-drive model has a starting MSRP of $28,650. Expect fuel economy to drop slightly to 27 mpg in the city and 33 mpg on the highway. The safety systems are improved on this higher trim level. They include a collision mitigation braking system, lane keeping assist, adaptive cruise control with low-speed follow, and road departure mitigation system as part of Honda Sensing. The CR-V EX also has auto high-beam headlights for particularly dark nights and a blind spot monitoring system with cross-traffic monitor. Other improvements to the interior make the CR-V EX even more convenient and enjoyable to drive. These include a push-button start, dual-zone automatic climate control, heated front seats, a power moonroof, and an upgraded entertainment system. That means a bump up to a 7-inch display, six total speakers, three added USB ports, HondaLink with Apple CarPlay and AndroidAuto compatibility, Satellite radio, and an SMS text message function. The 2019 Honda CR-V EX-L is the next trim level and starts at $29,750. If the CR-V LX upped performance and safety, the CR-V EX-L focuses on luxury. The all-wheel-drive version of the CR-V EX-L starts at $31,150 and has slightly worse fuel economy than the two-wheel-drive model. Combined EPA ratings are 30 mpg city/highway for the 2WD and 29 mpg city/highway for the AWD. One of the most prominent features is the addition of leather on the interior rather than cloth. The new leather seats are accompanied by a matching leather-wrapped steering wheel and shift knob. This CR-V EX-L also implements a power tailgate, power-adjustable seating, and an automatic-dimming rearview mirror, but that doesn’t even begin to cover the improvements. Drivers will appreciate the HomeLink Remote System. HomeLink can open and close your garage door, but also lets you control lighting, appliances, electronics, and security systems. The audio system is also upgraded yet again. The CR-V EX-L includes eight total speakers and the option to add the Honda Satellite-Linked Navigation system. The 2019 Honda CR-V Touring is the most expensive, but also must luxurious, of the CR-V trims. The starting MSRP is $32,750 and includes every feature you could want in an SUV. These include a hands-free access power tailgate, full LED headlights, and rain-sensing windshield wipers. Honda’s satellite-linked navigation system also comes standard with the CR-V Touring, making it easier to go anywhere your heart calls you. The all-wheel-drive version of the CR-V Touring starts at $34,150. Fuel economy for the AWD model remains unchanged from the previous trim. The CR-V Touring is the only trim that increases the safety by including auto-on and -off LED high beams for particularly dark nights. That isn’t the only exterior feature that was added, however. It also comes with roof rails and dual chrome exhaust finishers, which add a sleeker touch to the crossover. On the interior, the CR-V Touring improves the sound system once again to include nine 330-watt speakers with a subwoofer. This sound system is perfect for long trips across the country or just jamming out to your favorite tunes on a Saturday evening while using the voice-activated radio.